Gamers' hand-eye coordination is distracted by the crash and jitters of energy drinks. Harvard researcher and Brain Institute Director identifies GungHo energy shot for the brain as a possible solution. The market for energy drinks is a huge red ocean, but with “faster reactions and no distractions,” GungHo is betting it’ll be worth talking about. Read the white paper or check out their launch offers at GoGungHo.com. GungHo is an energy shot for the brain. It was launched by Go GungHo, Inc. out of Salt Lake City, UT in early 2012. 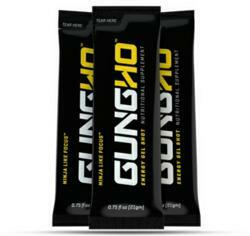 More than simple alertness, GungHo’s proprietary blend of ingredients are proven to increase focus, concentration, memory storage, and memory recall, while avoiding the harsh rush, jitters, and crash common with other energy products.